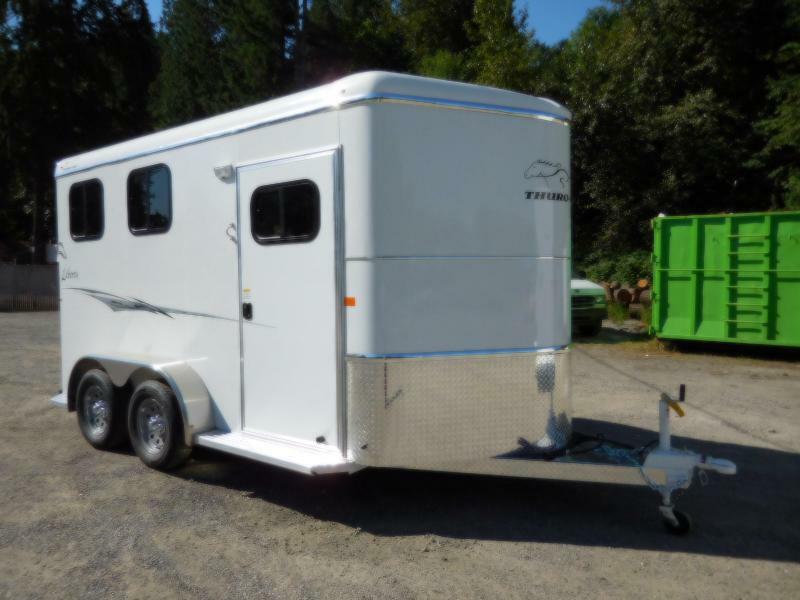 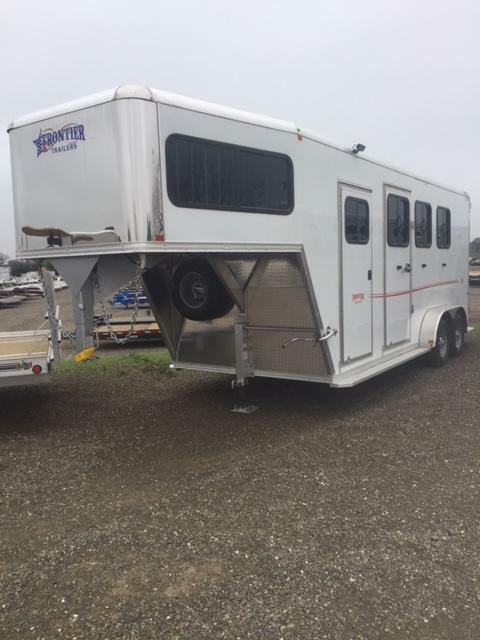 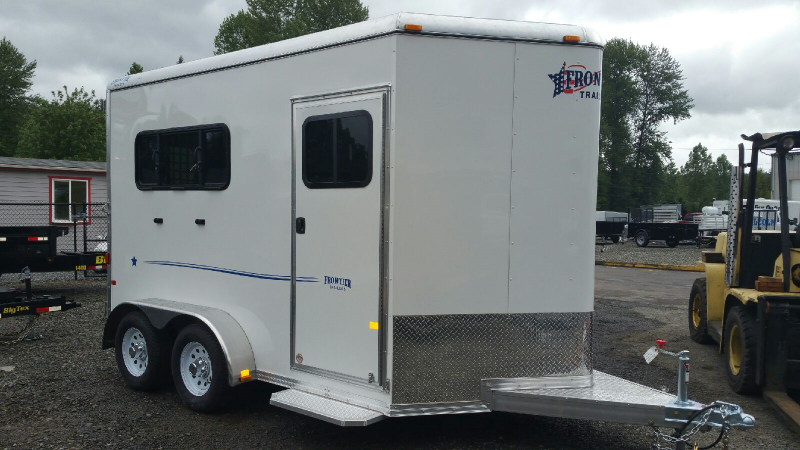 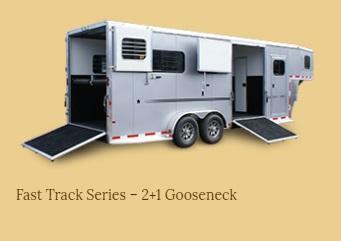 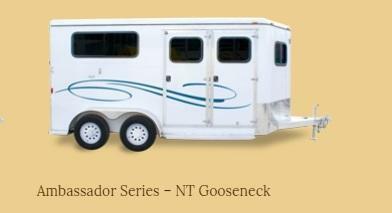 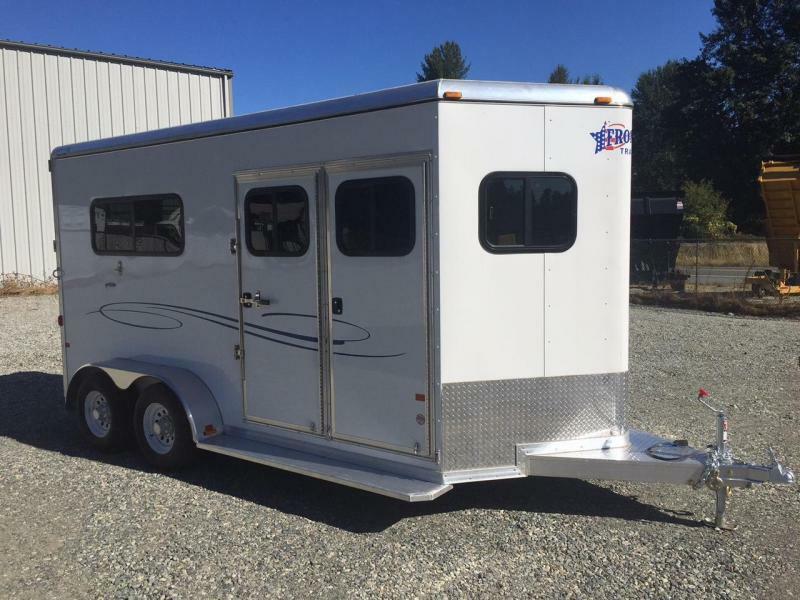 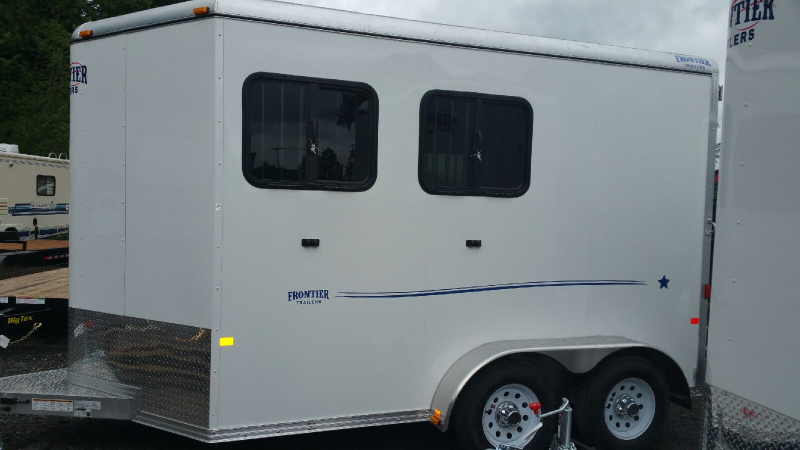 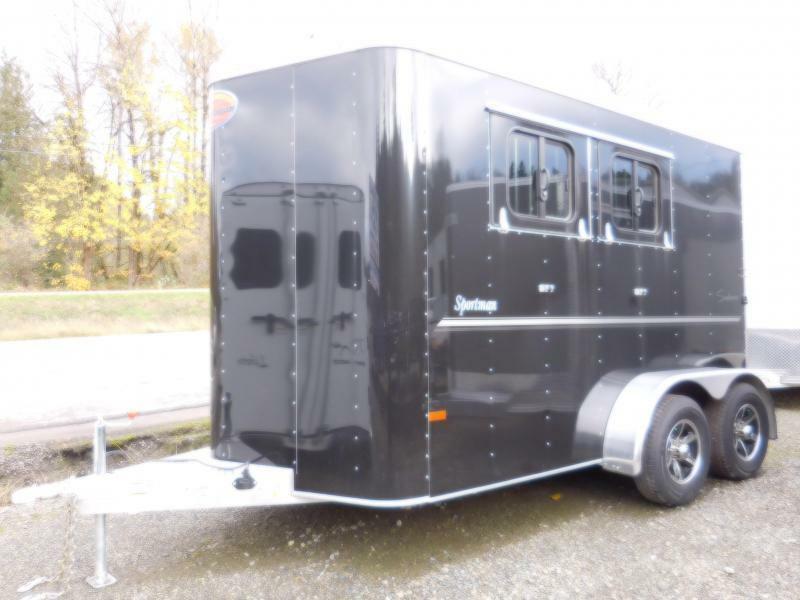 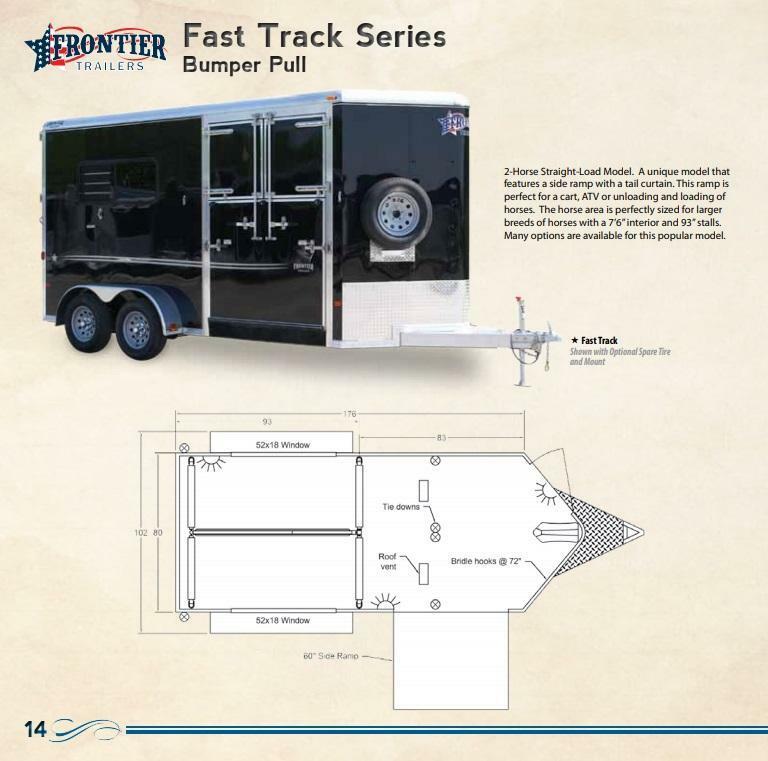 FRONTIER Horse Trailers: Lightweight Trailers built tough enough for your horses and livestock!! 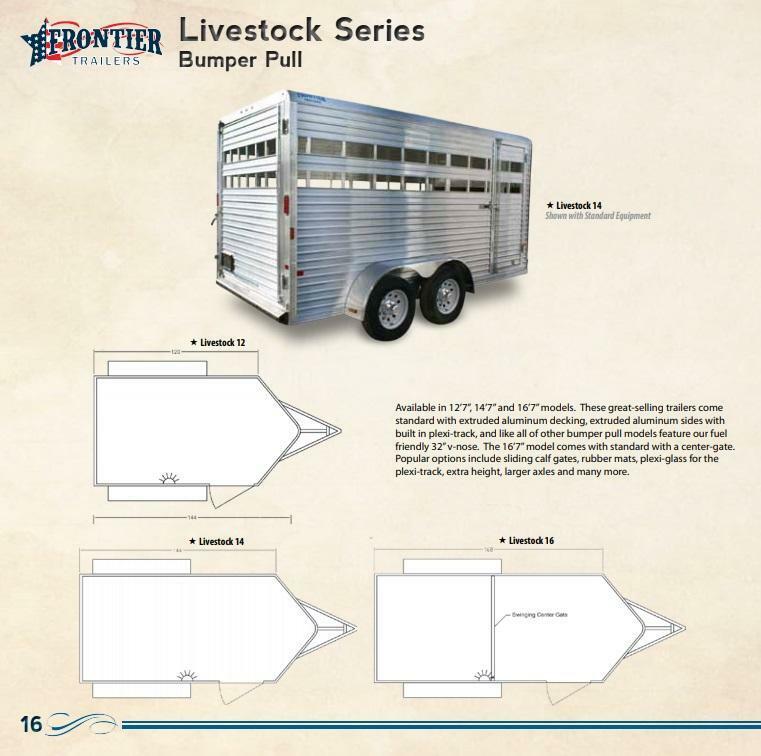 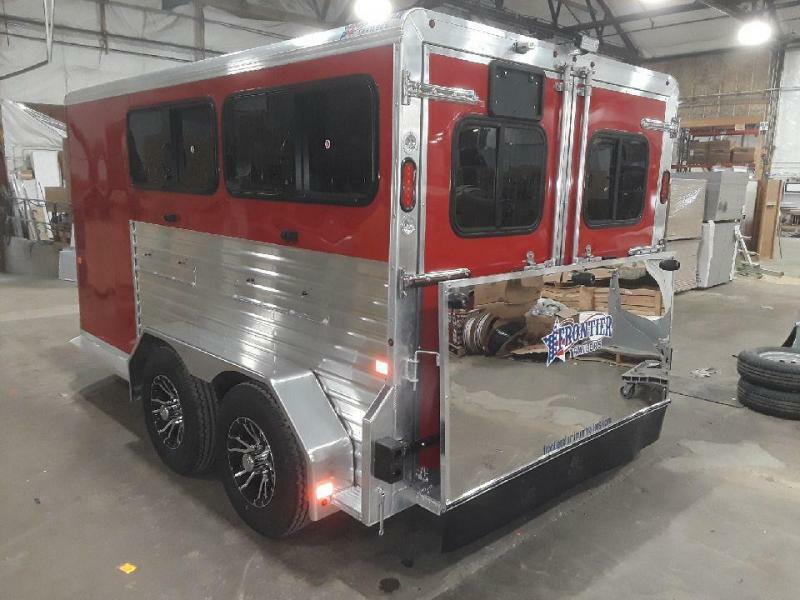 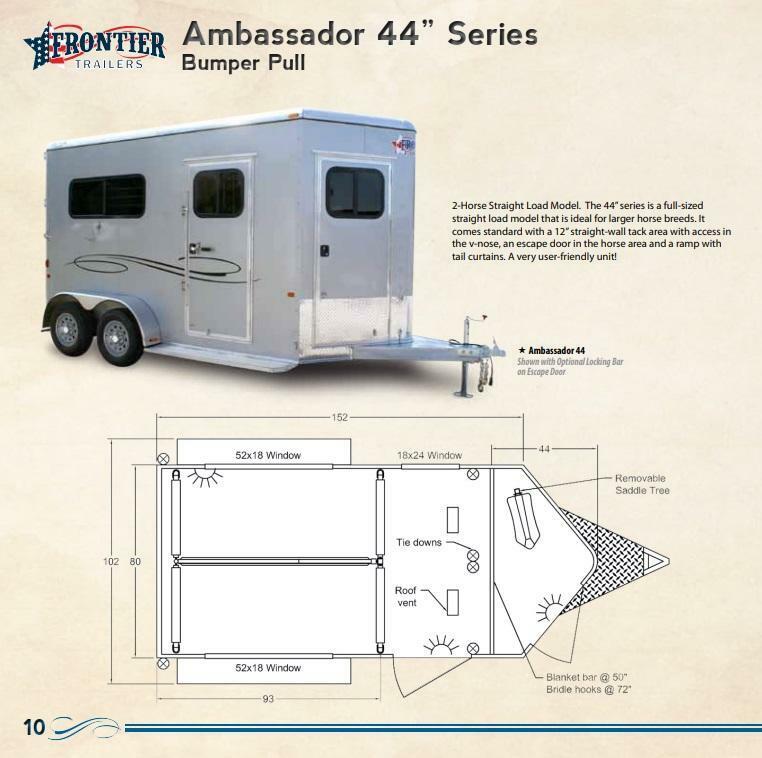 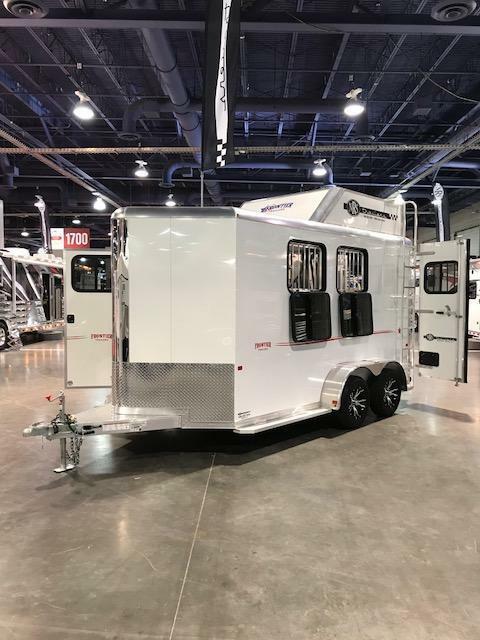 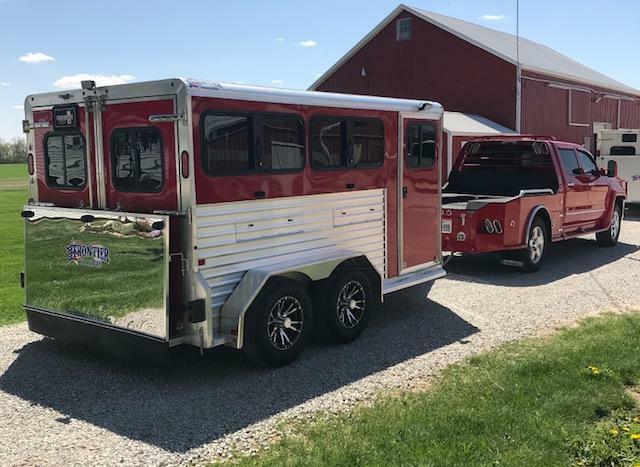 Frontier Aluminum Trailers features 11 standard models in the all-aluminum bumper pull category for both livestock and horses. 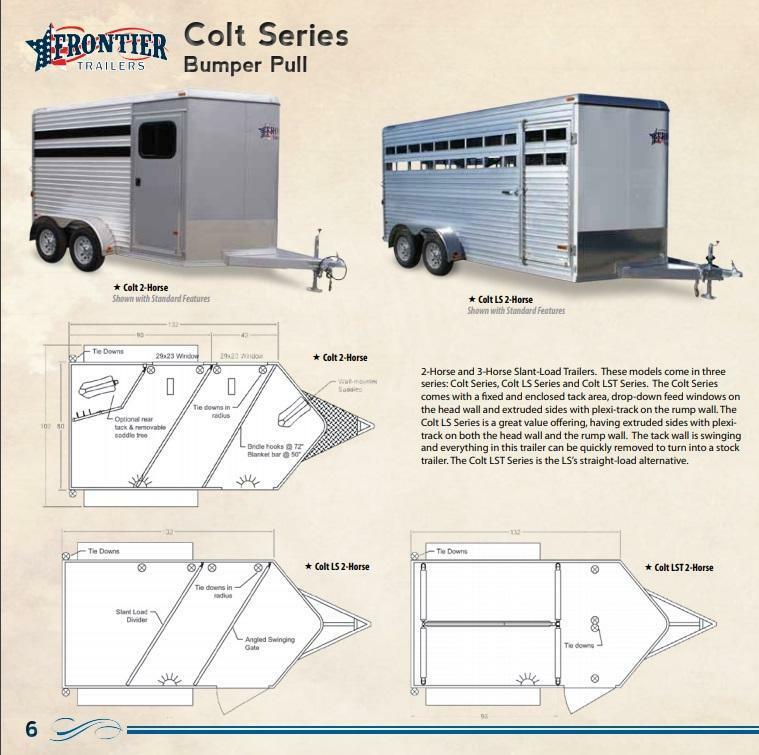 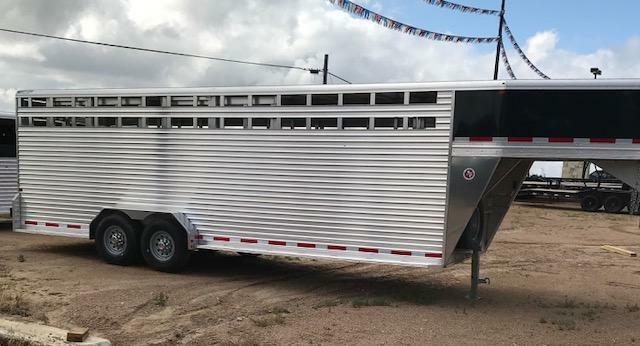 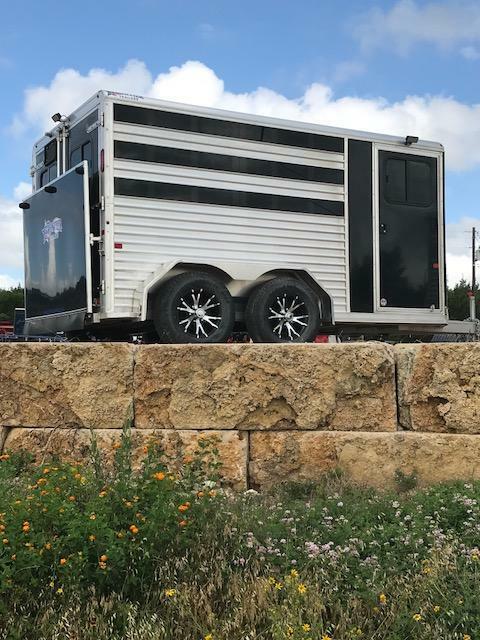 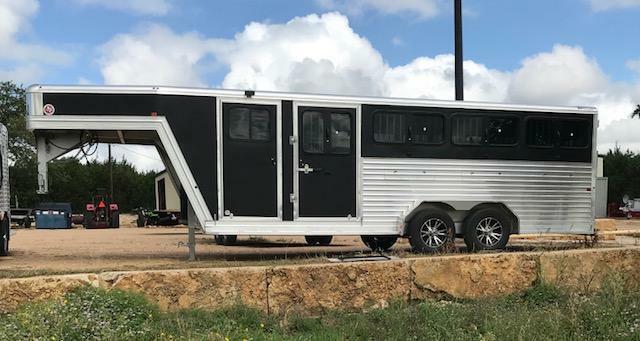 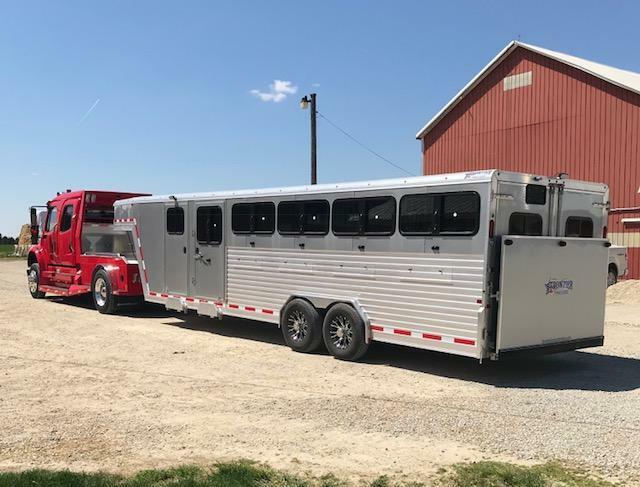 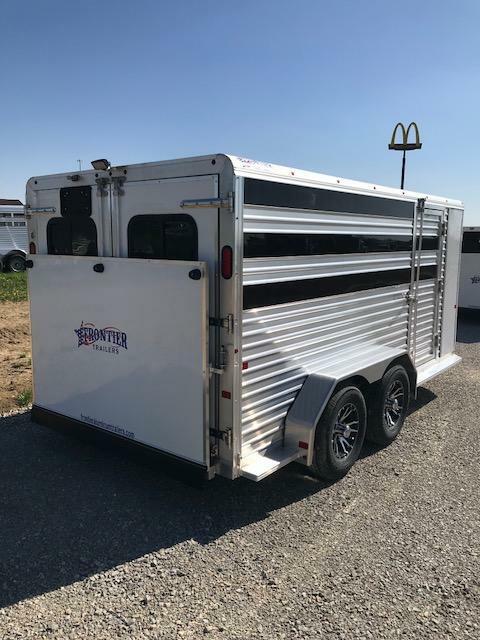 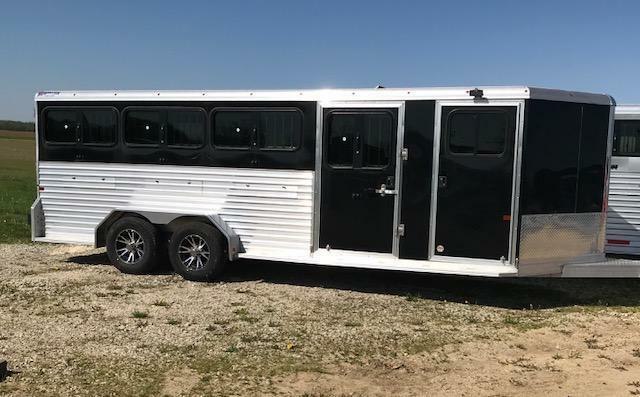 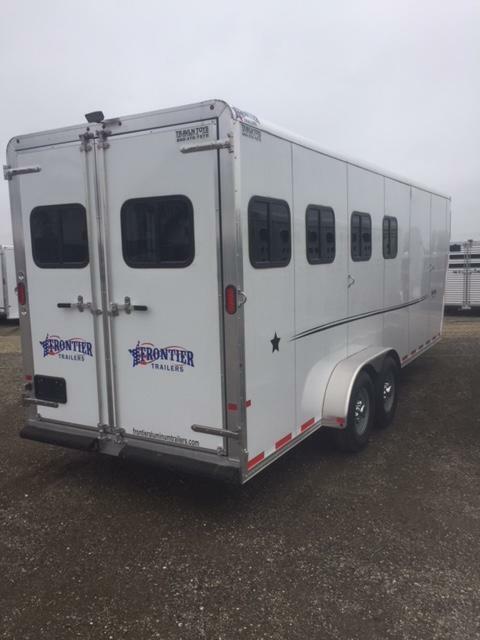 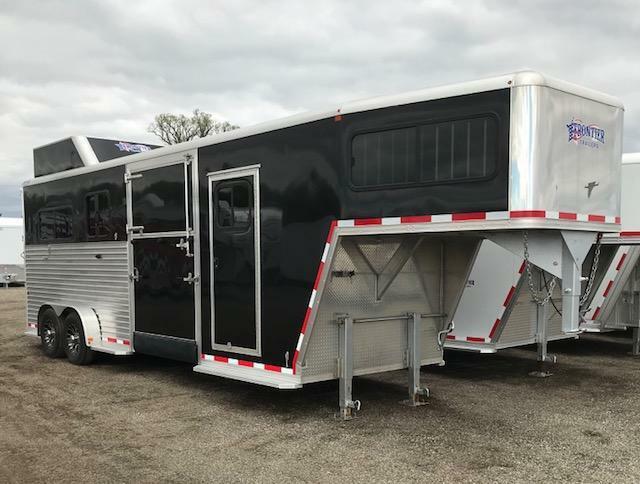 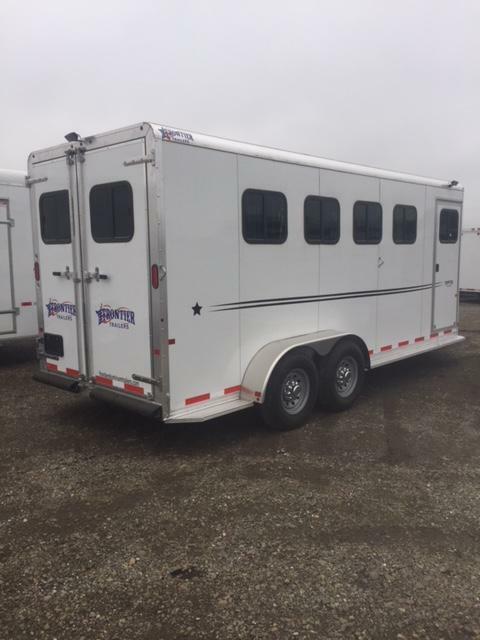 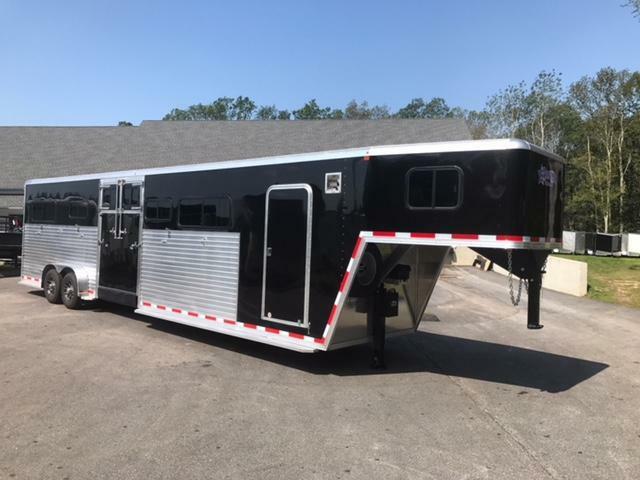 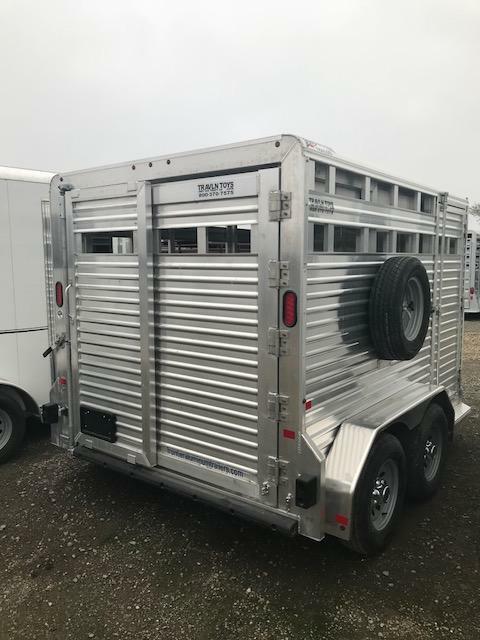 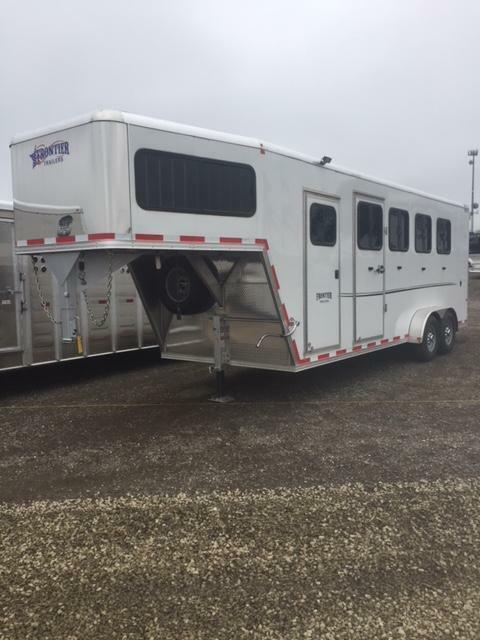 The Frontier aluminum trailers lineup includes slant load and straight load models and are manufactured with many standard features veteran horse and livestock consumers' demand, with a large options list to meet a broad range of consumer's specific needs. 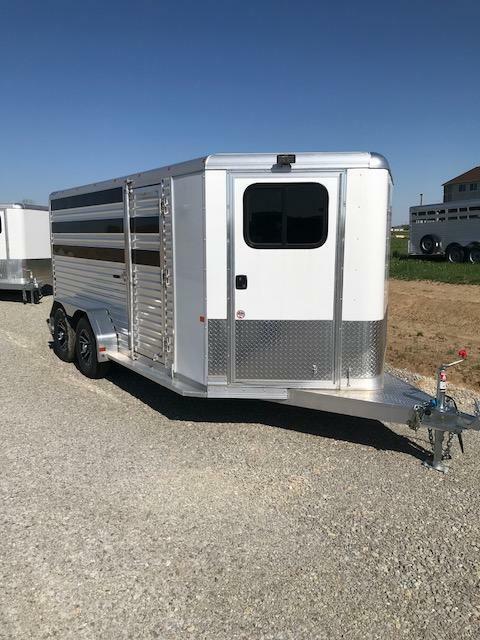 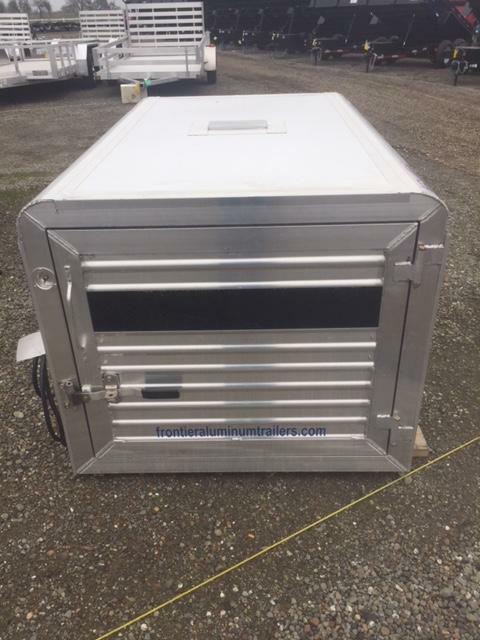 These sturdy, yet lightweight aluminum trailers are affordably priced and built with the highest safety standards in the industry - Strong Frame without additional weight, Rust free compared to steel trailers and Sleek, updated design to set you apart from others!! 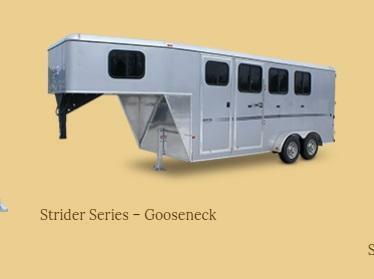 See our picture gallery of different models, and set ups available. 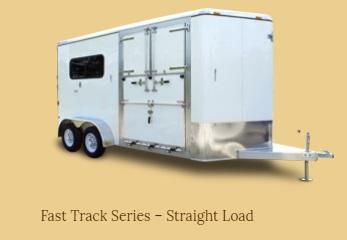 Customized trailers are available to order also. See the list of upgraded options you can do below. 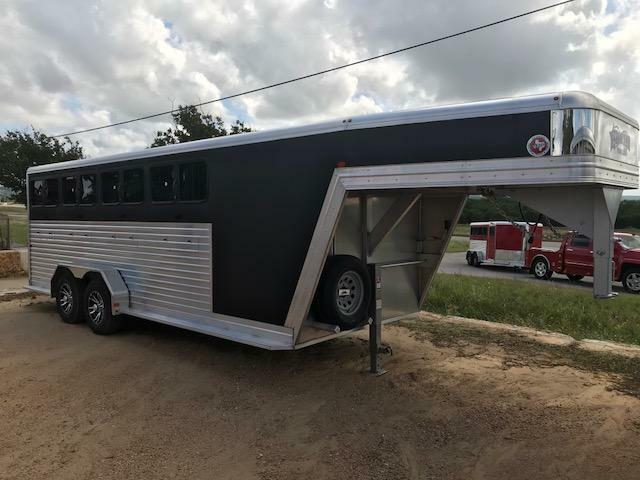 For additional upgrades, please ask. 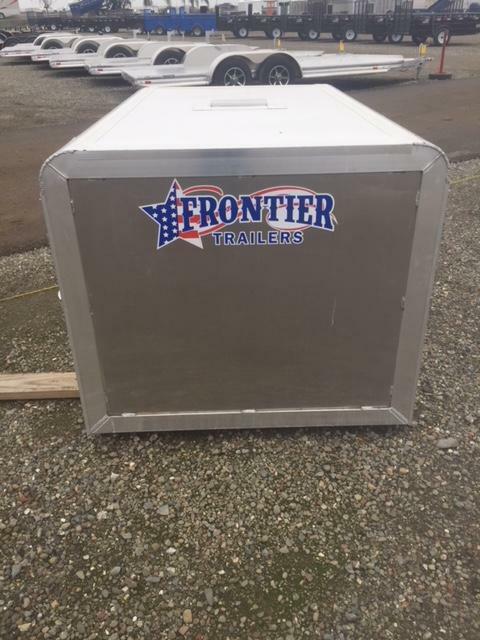 Frontier Aluminum Trailers is an ALCOM LLC (ALuminum COmpany of Maine) product line. 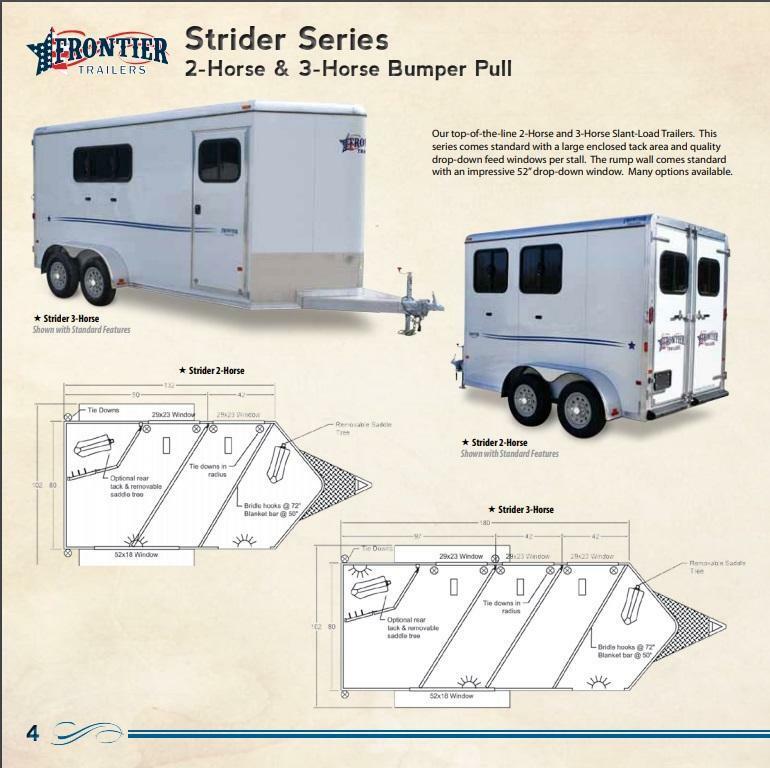 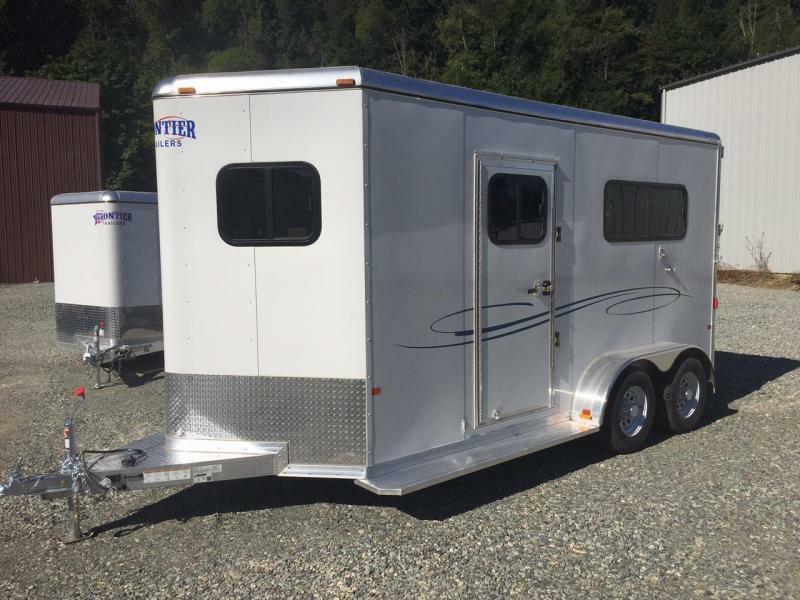 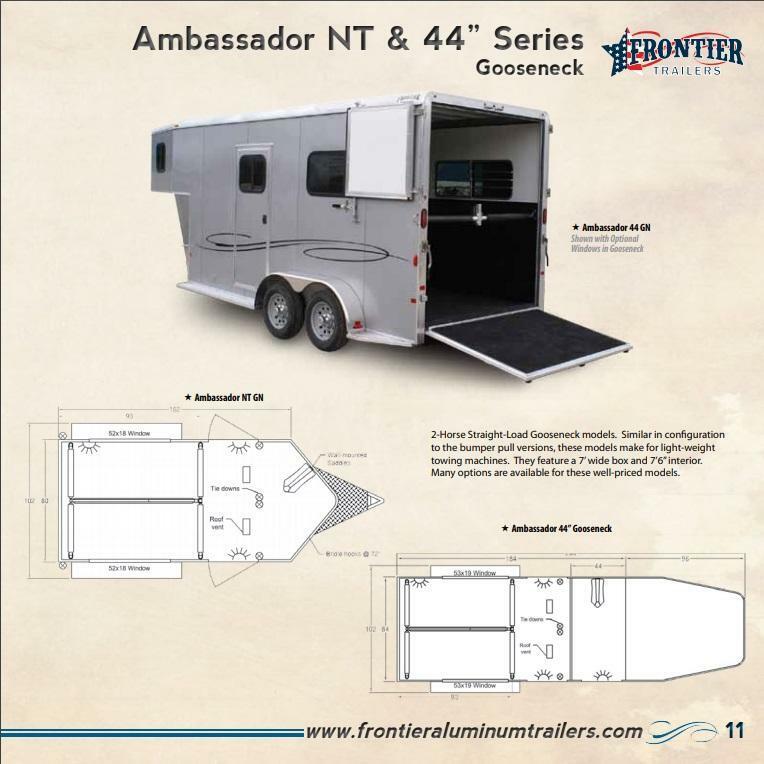 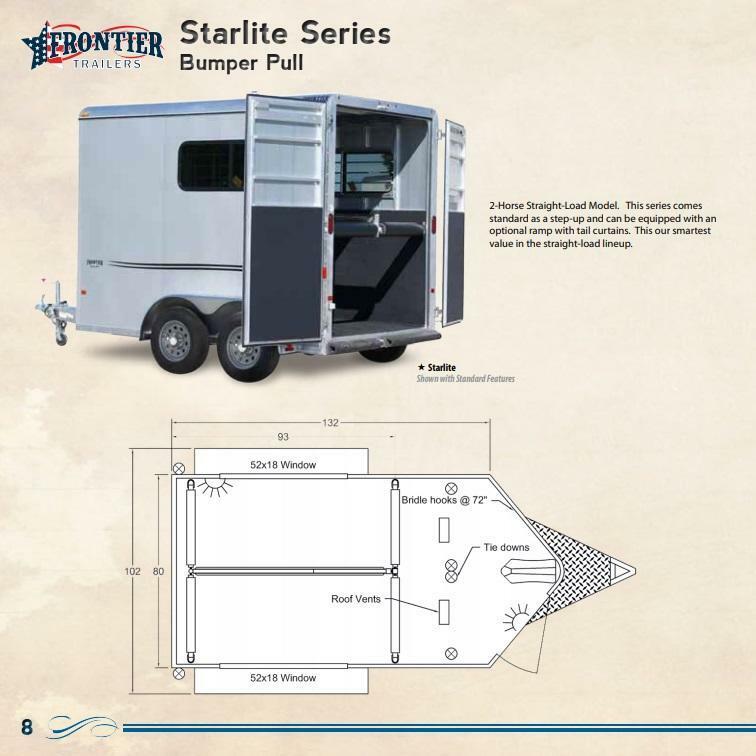 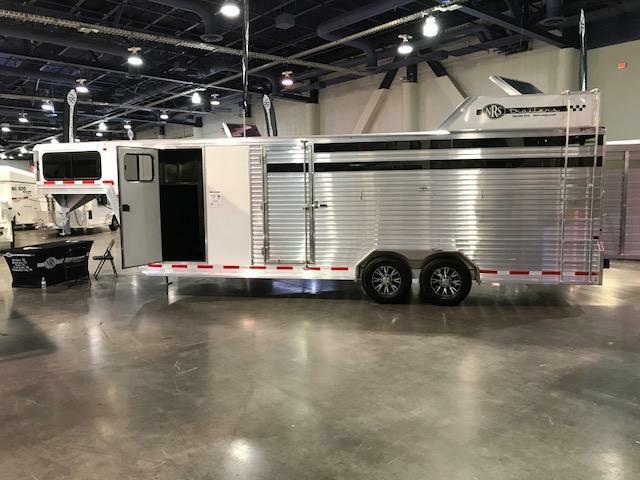 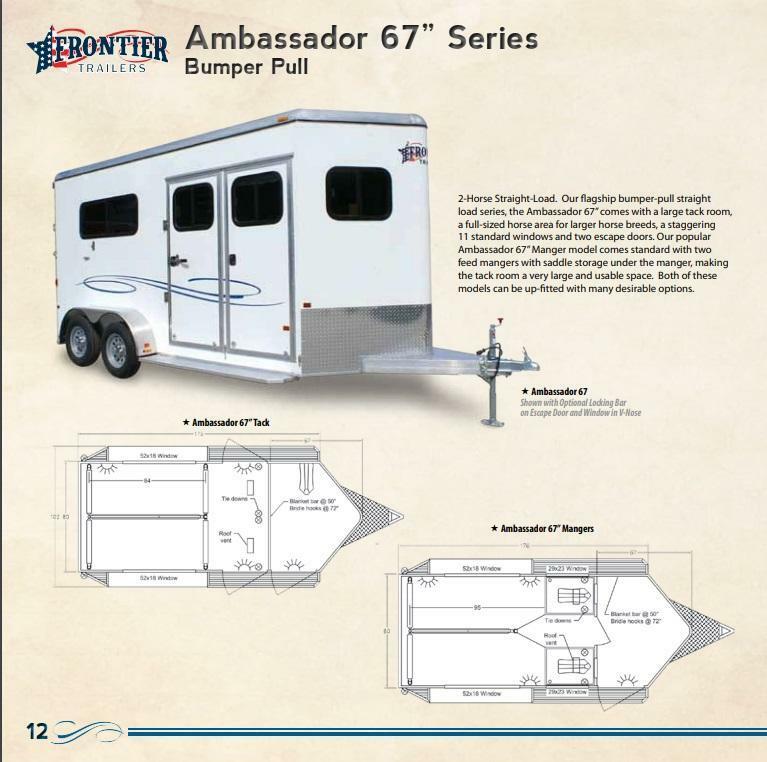 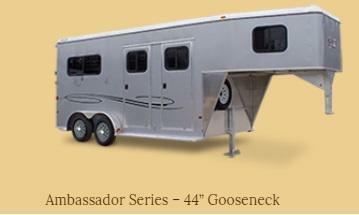 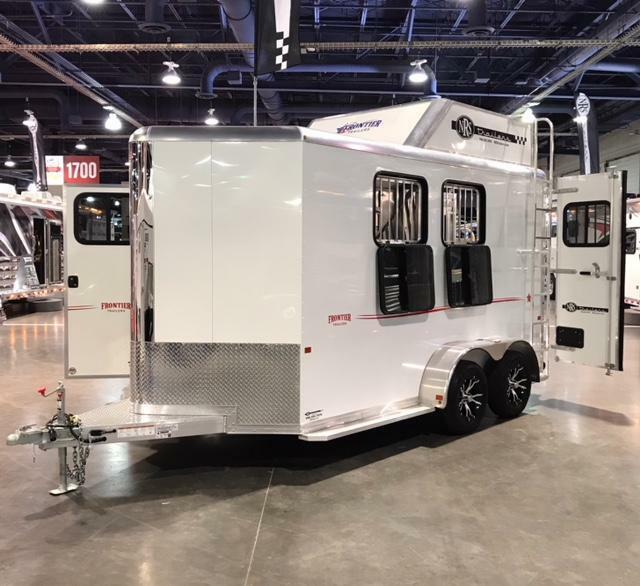 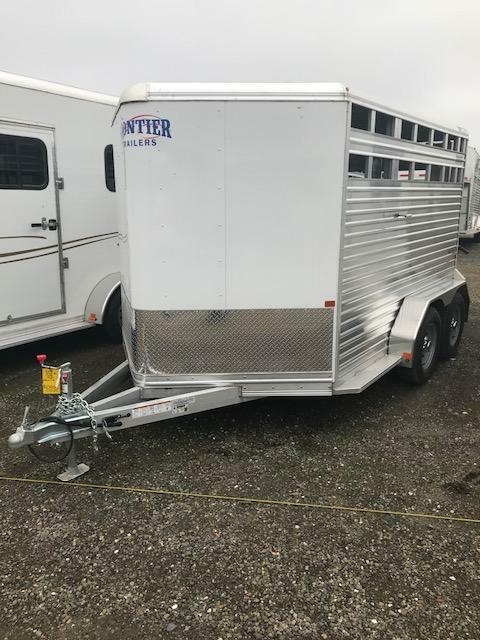 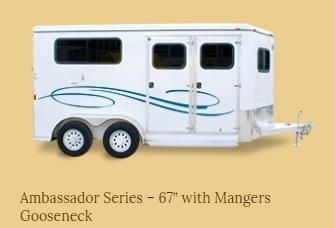 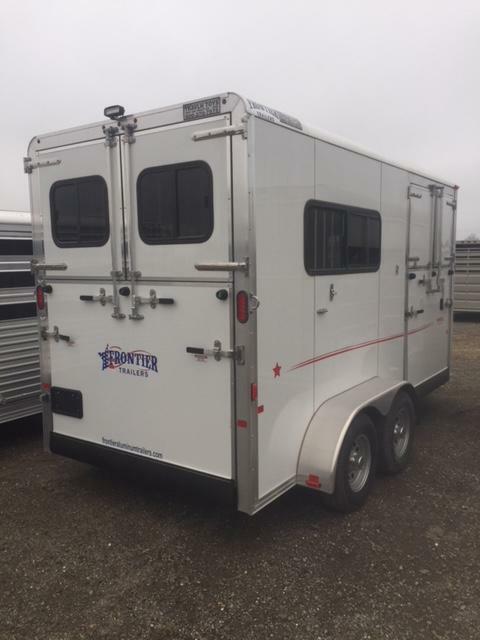 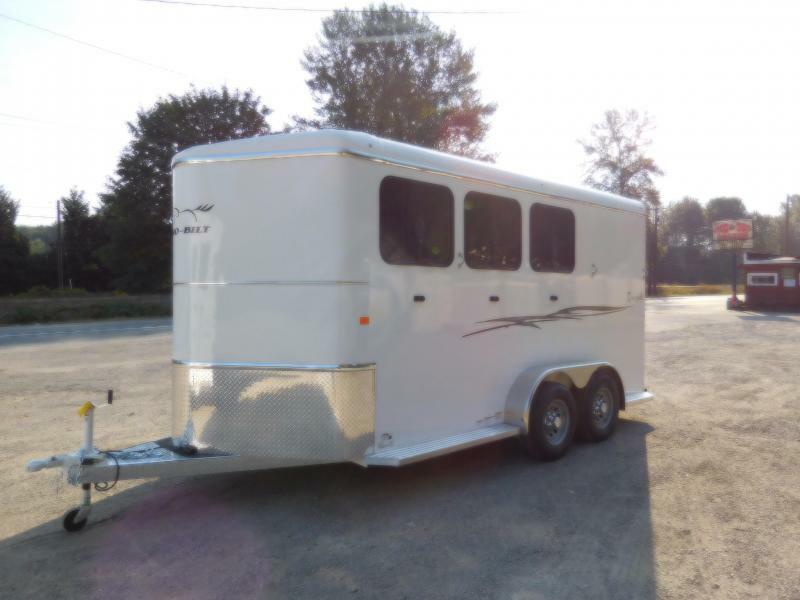 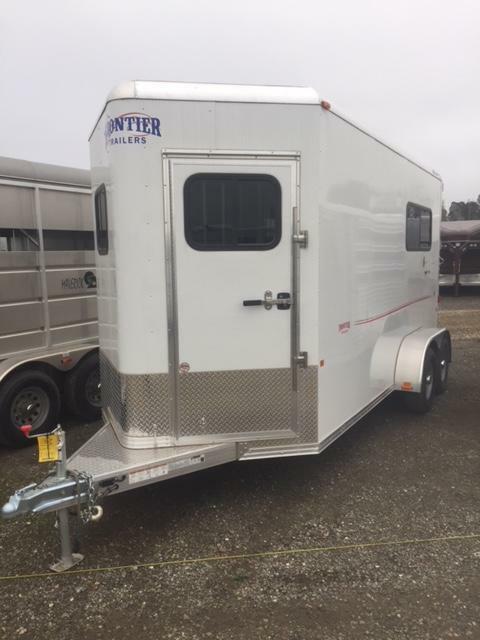 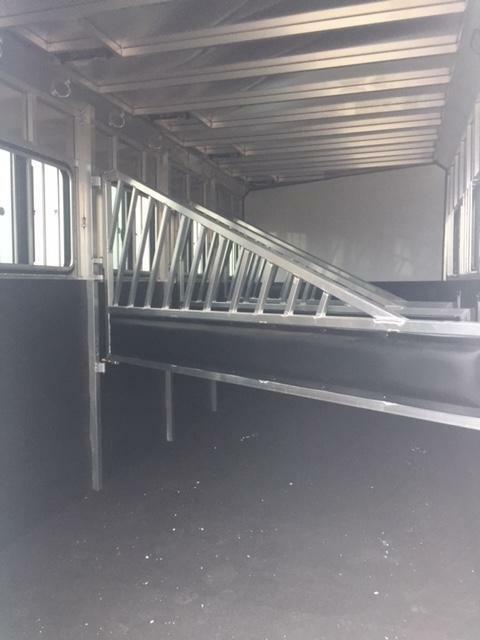 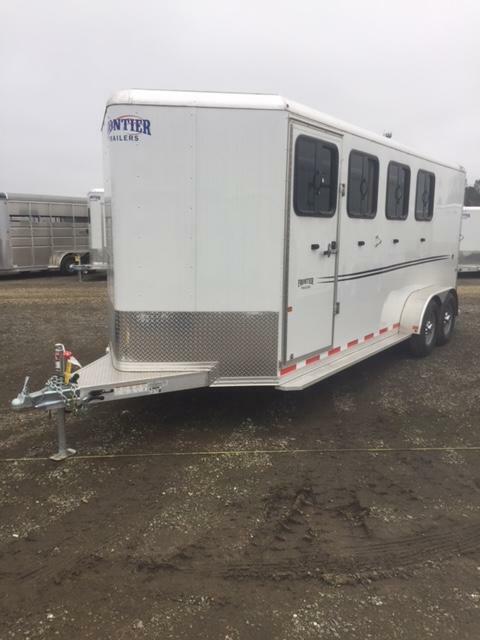 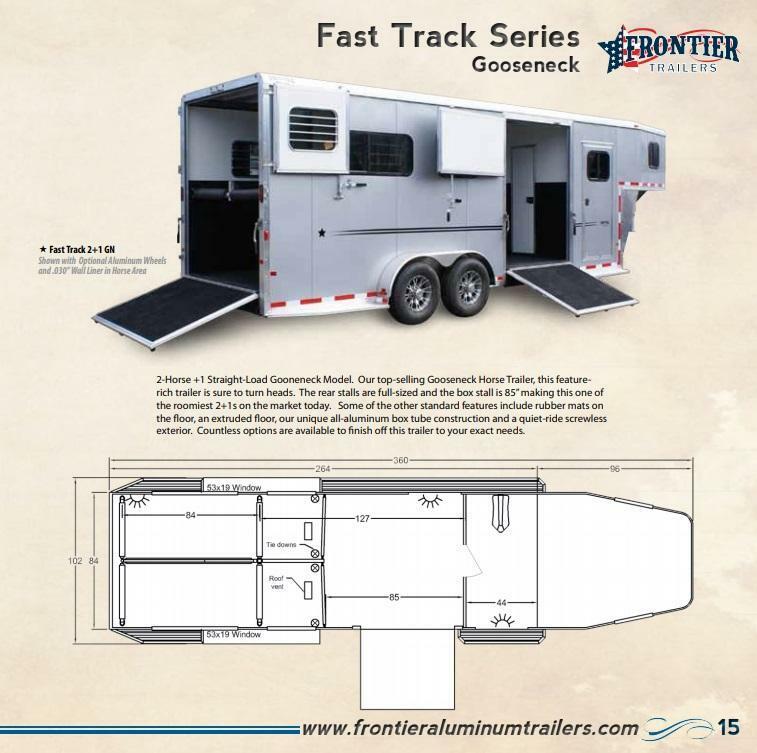 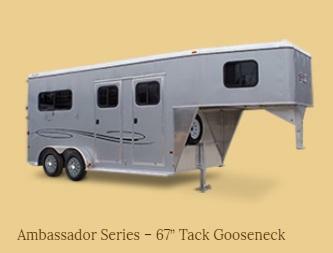 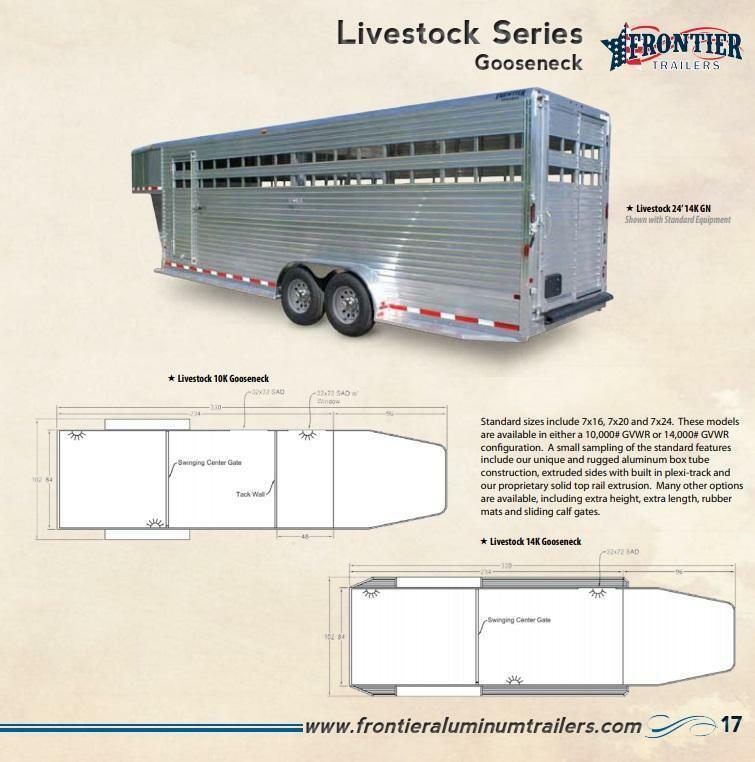 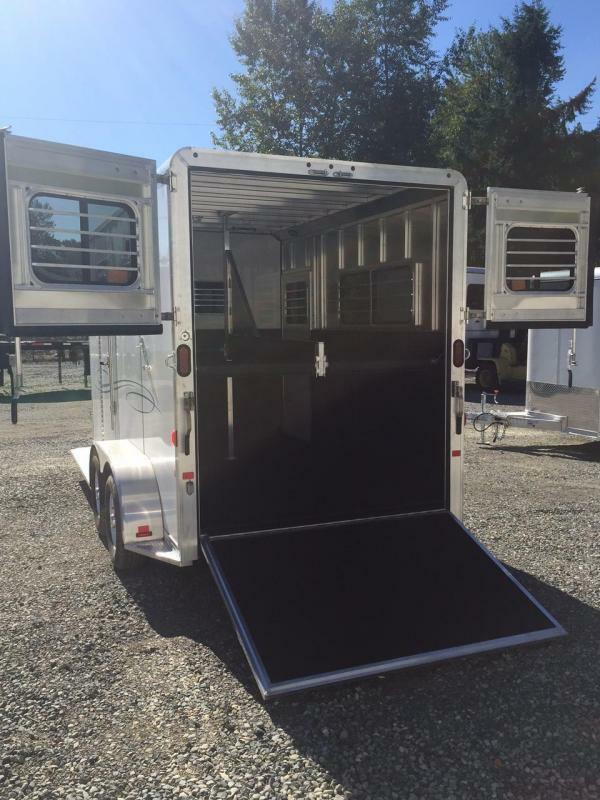 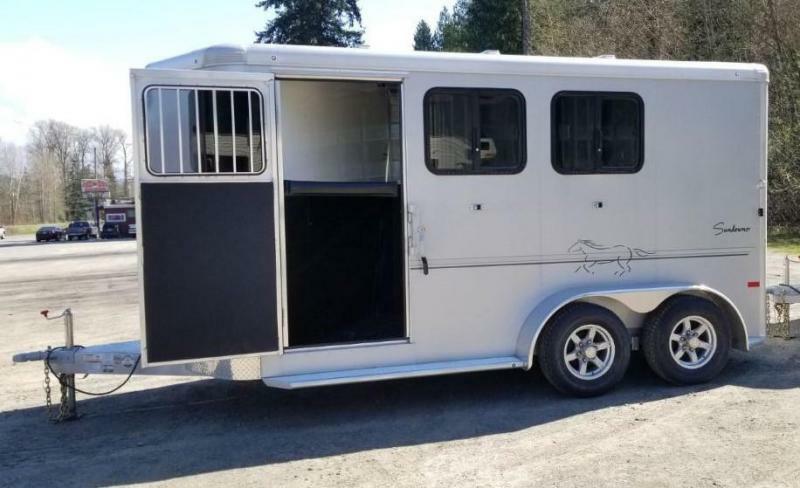 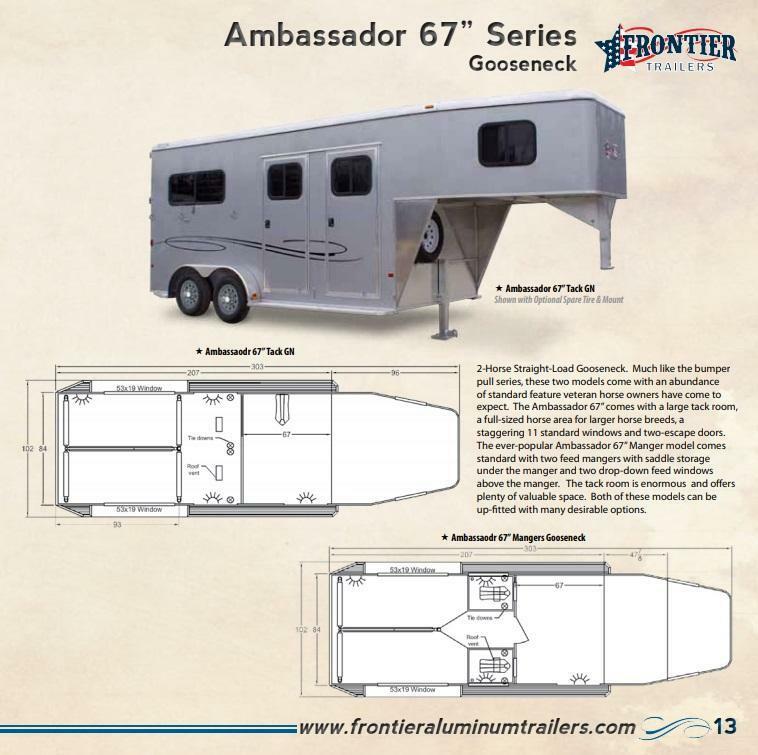 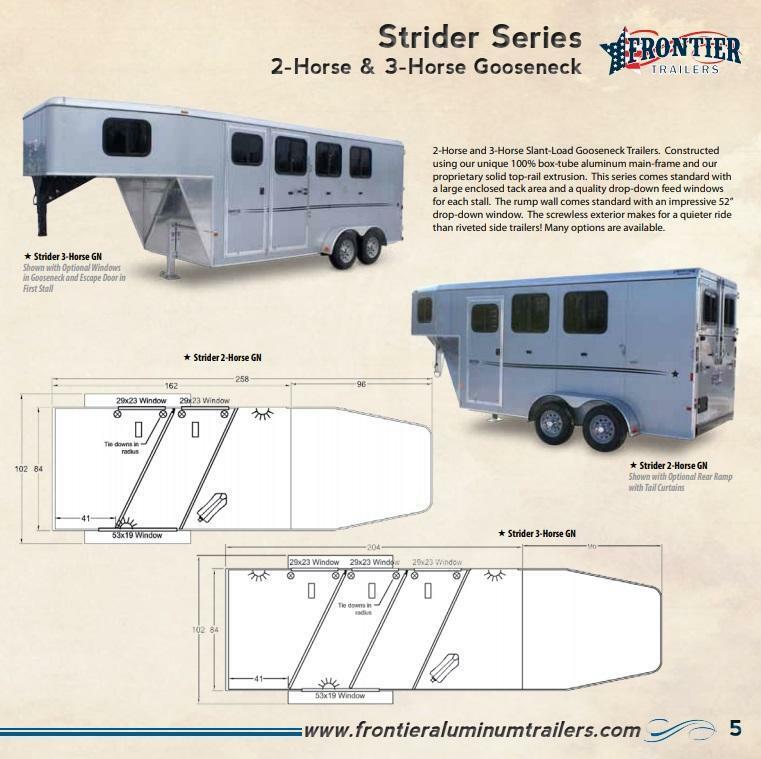 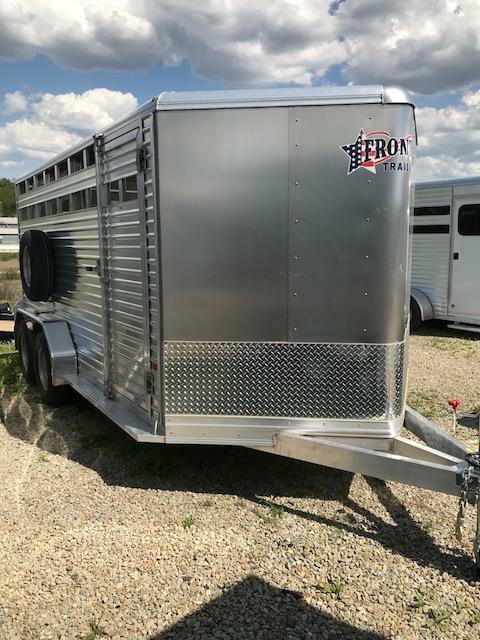 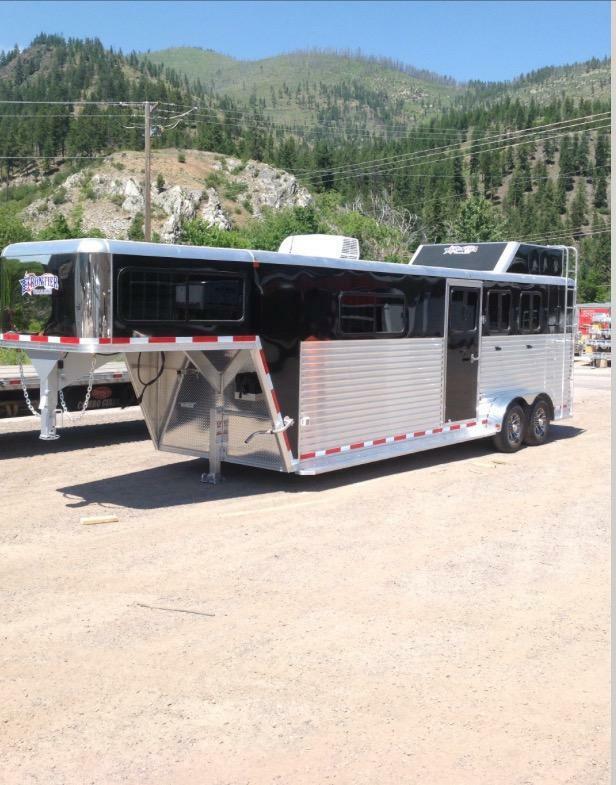 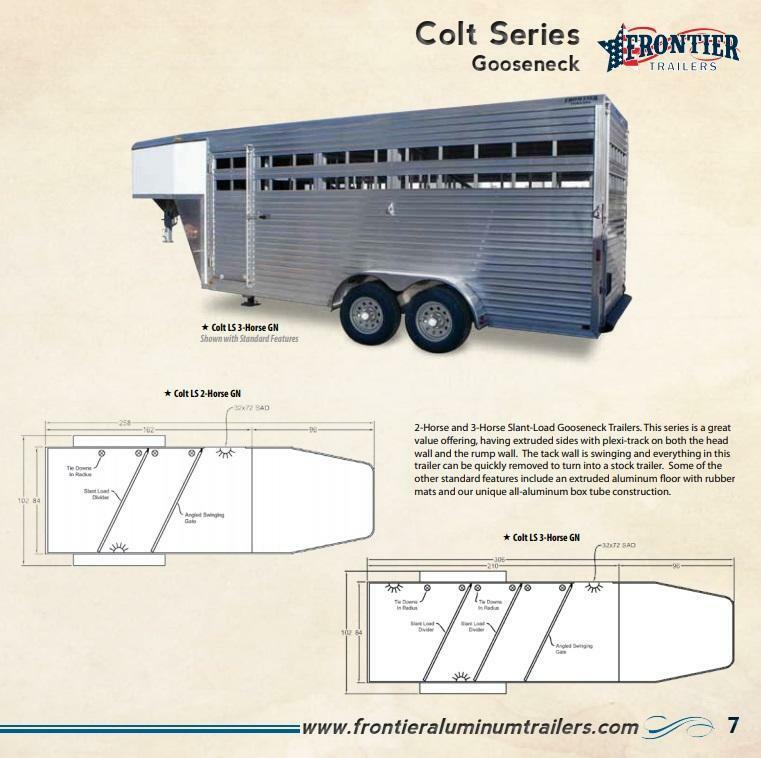 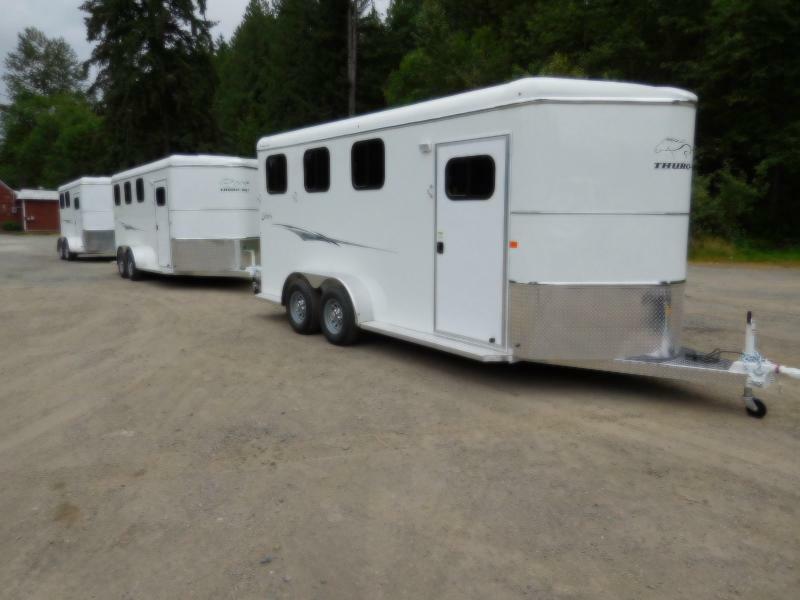 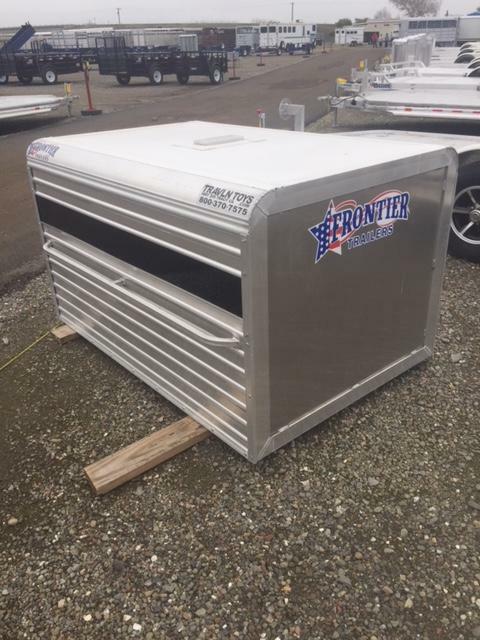 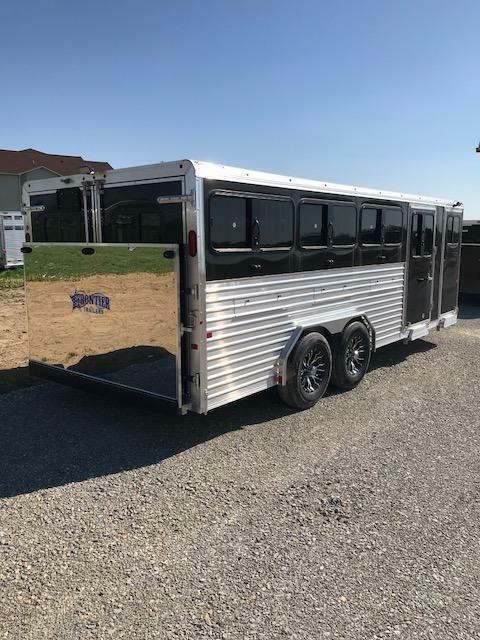 Frontier is a line of aluminum horse trailers, aluminum livestock trailers. 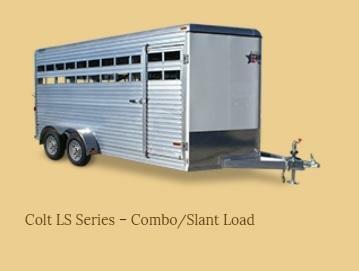 Ranging in sizes for single to multiple horses and different types of livestock. 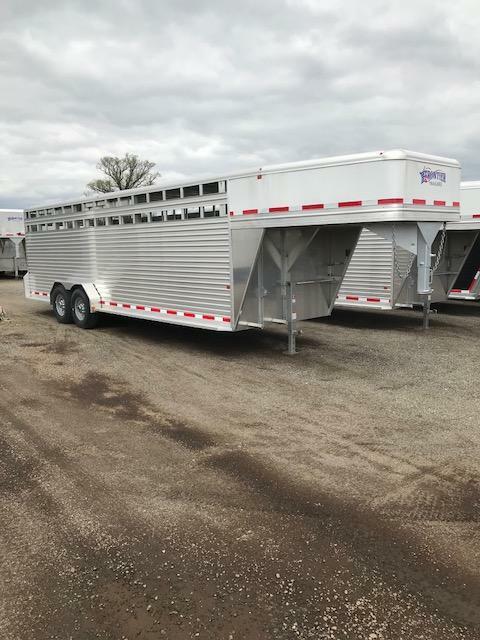 These Aluminum trailers are designed to offer the same features that steel units have to offer yet at a more affordable prices. 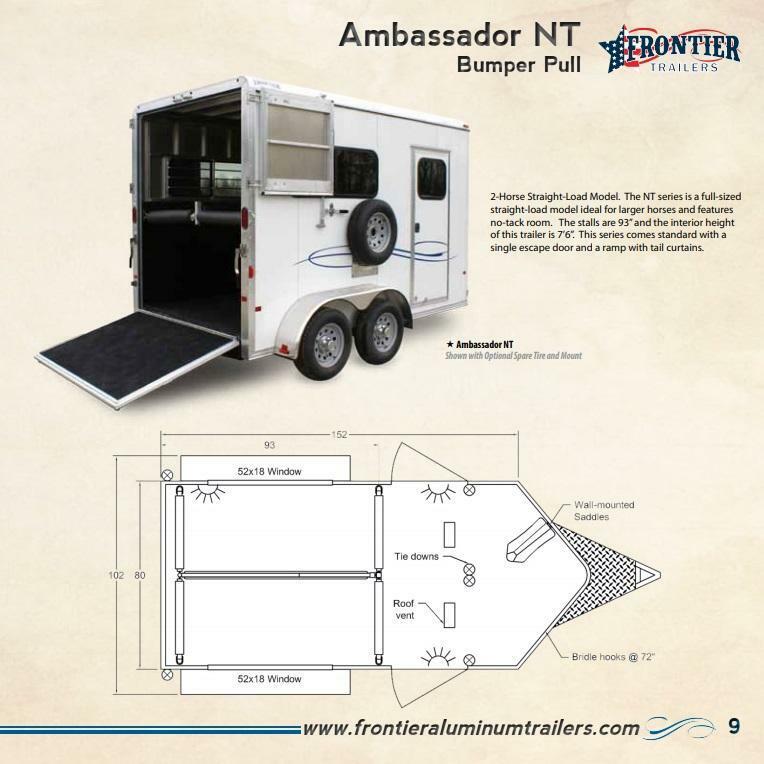 With rising fuel prices and increased consumer education with regard to quality and durability, Frontier Aluminum Trailers have been a tremendous success for the ALCOM product line. 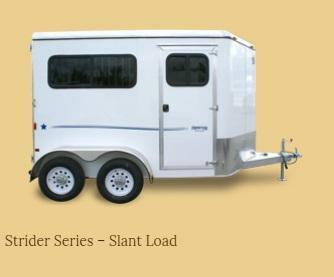 ALCOM LLC is a NATM (National Association of the Trailer Manufactures) certified company. 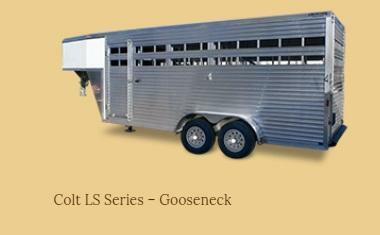 We manufacture to established industry standards and U.S. 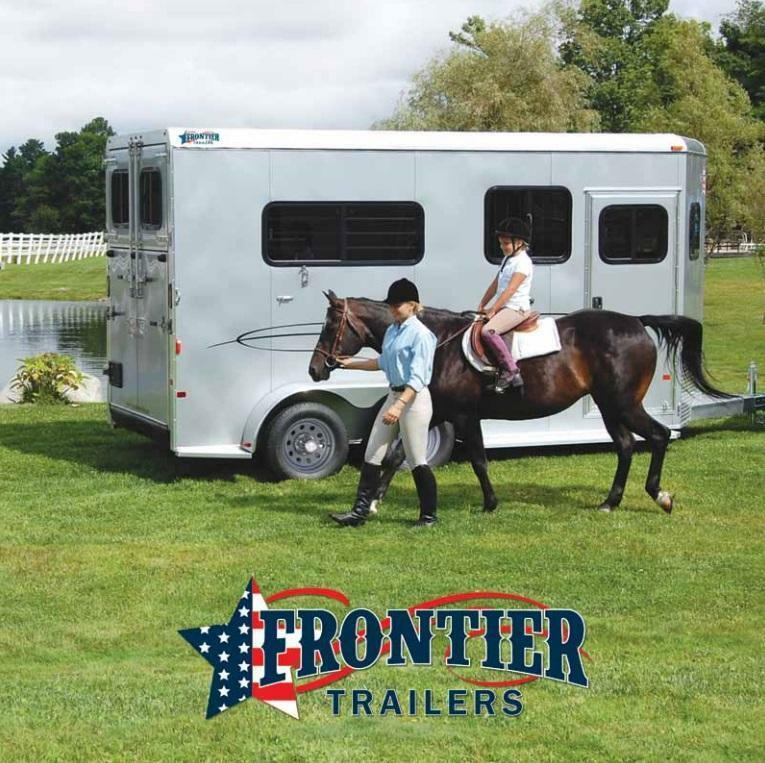 DOT's federal Motor Vehicle Safety Standards (FMVSS). 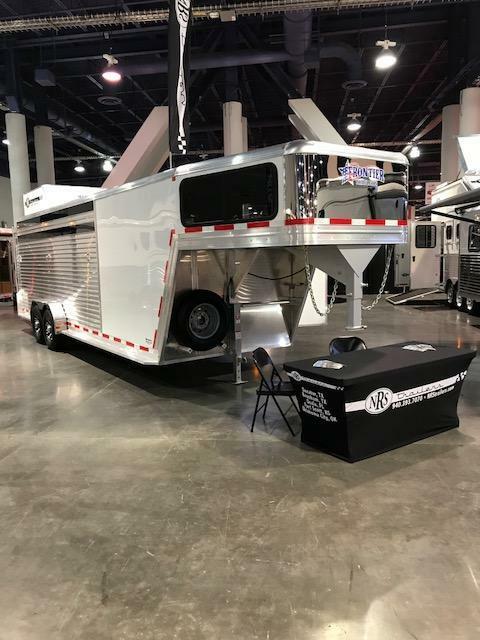 We're proud to be an American-owned company focused on designing and building the highest quality aluminum trailers available. 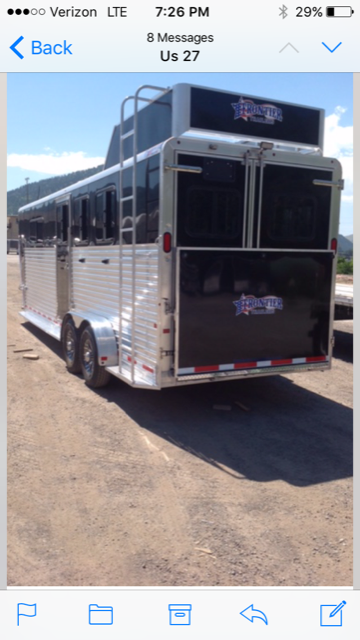 There are a lot more upgrades, they will do custom upgrades. 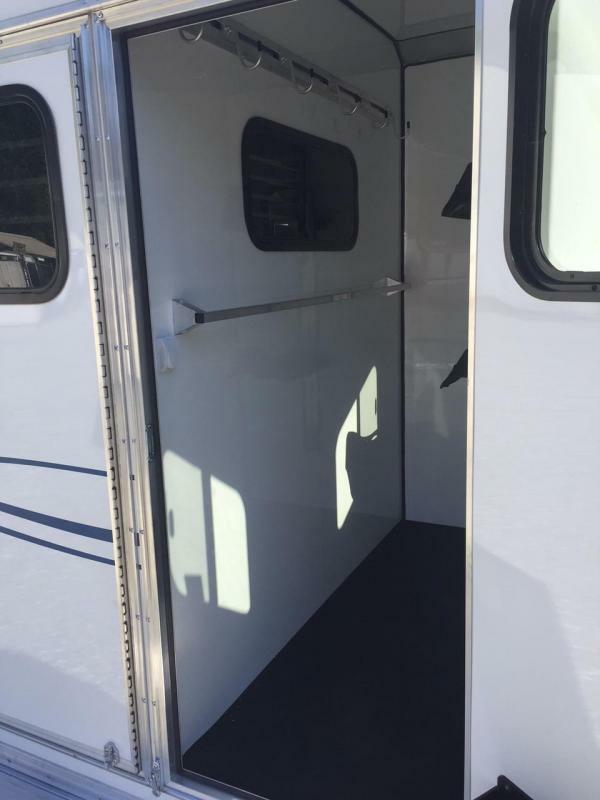 Come on in, or email us for a special/custom quote. 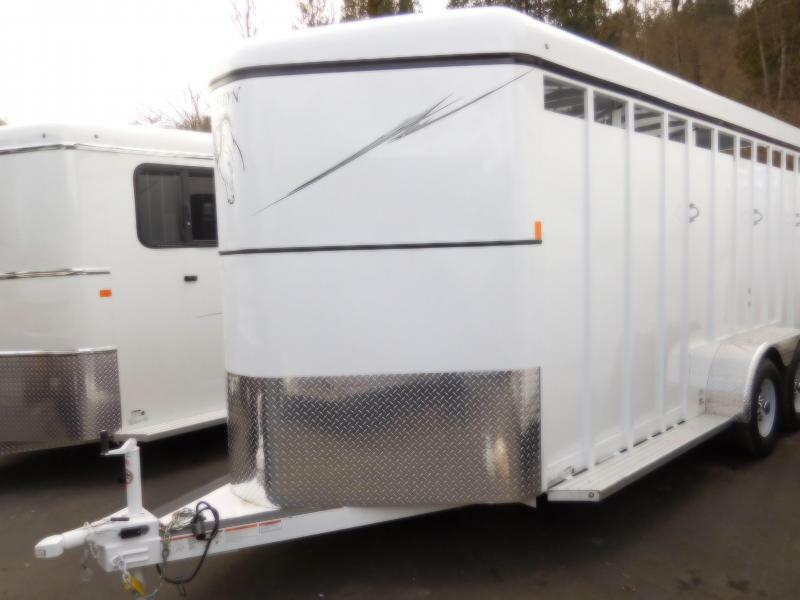 Let us know the trailer model, size, upgrades/options you want and we can email you back within a day with a full written estimate. 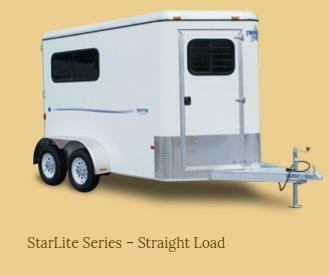 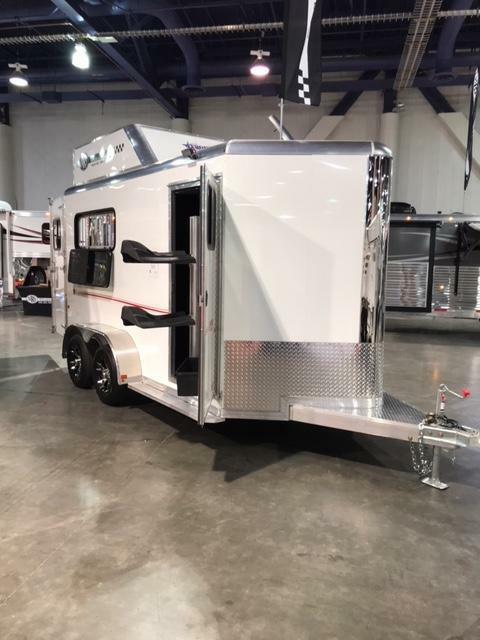 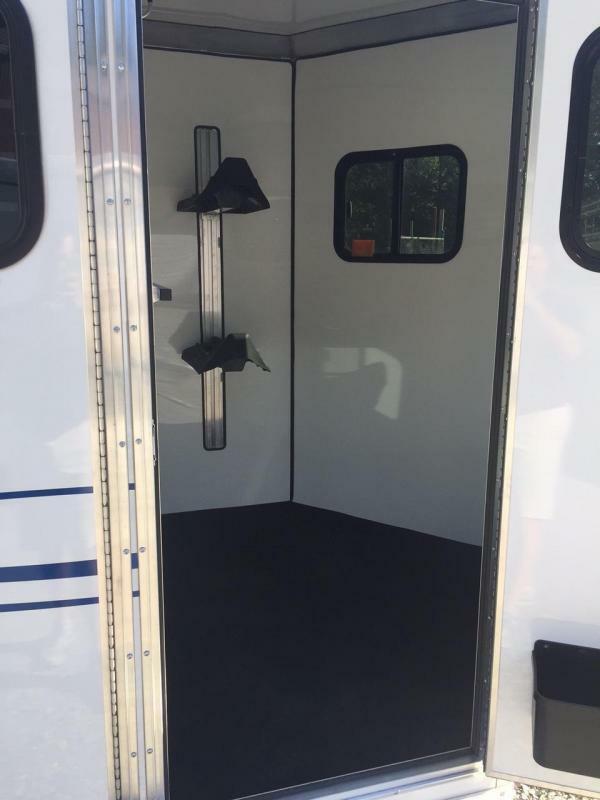 Each model has its only standard features on the trailer and there is a big list of upgrades you can do with most of these trailers. 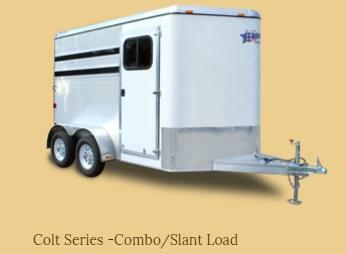 PLEASE NOTE: These trailers must be ordered. 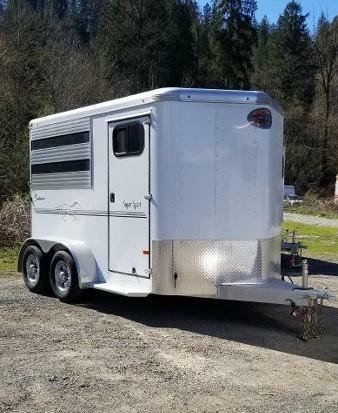 Build time can very depending on the time of year. 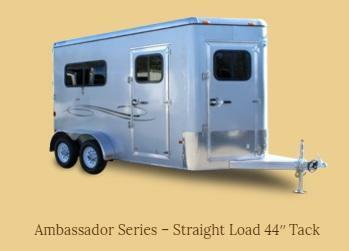 Please ask a sale associate at Trailers Northwest (425) 413-5956 for a quote.